ADELANTO, CA (October 11, 2017) – Grammy-winning R&B artist Miguel will headline Friday’s free community Schools Not Prisons concert joined by Los Rakas, Ceci Bastida and Buyepongo to advocate for the closure of all immigrant prisons. The event will be emceed by comedienne Cristela Alonzo. The concert comes just two weeks after Governor Jerry Brown signed a new bill by Sen. Ricardo Lara, which will limit the growth of immigrant prisons and takes a strong stand against profiteering by private prison interests. 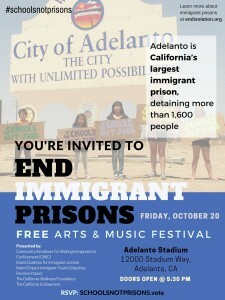 The #SchoolsNotPrisons Adelanto concert will bring artists, advocates, and community members together for a historical event, creating a unique platform to advocate for the closure of immigrant prisons and shine a light on the many ways for-profit immigrant prisons harm California communities. Centered at the intersection of art and activism, #SchoolsNotPrisons Adelanto will spark meaningful dialogue around the practice of unjust immigrant incarceration and the cruel conditions of immigrant prisons – generally misrepresented as immigrant detention centers. The upcoming #SchoolsNotPrisons tour stop is presented by CIVIC, the Inland Empire-Immigrant Youth Collective, the Inland Coalition for Immigrant Justice (ICIJ), and produced by Revolve Impact, which has organized the statewide tour since the summer of 2016. The tour promotes a vision of community safety focused on prevention rather than incarceration, and supports local advocacy campaigns that call for more effective, community-based alternatives rather than severe forms of punishment, particularly for vulnerable populations. About 1,600 people are incarcerated in Adelanto’s immigrant prison, which is owned and run by the for-profit prison company GEO Group. 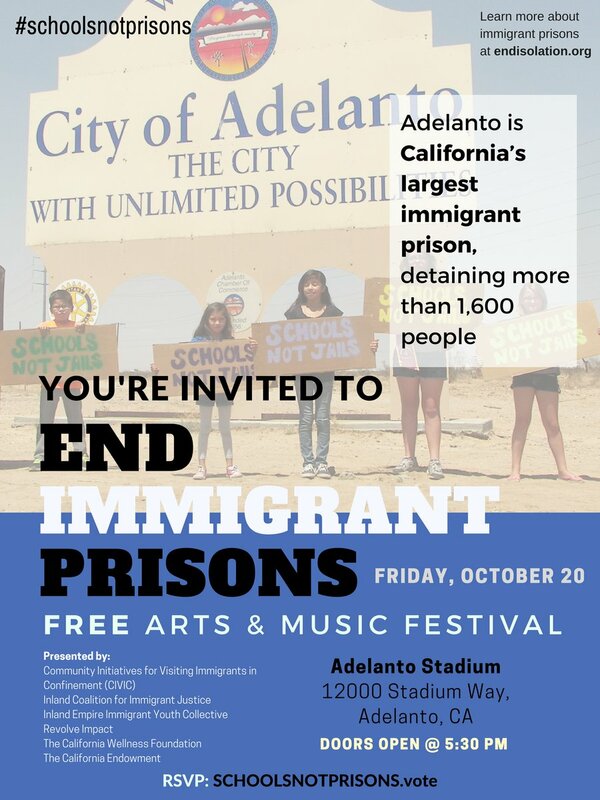 The #SchoolsNotPrisons tour stop in Adelanto will take place at the Adelanto Stadium, with gates opening at 5:30pm and the concert starting at 6pm. Guest speakers will include those who’ve been incarcerated inside the Adelanto immigrant prison. Admission to the concert is free, but people are encouraged to register in advance through this Eventbrite link because the event is expected to reach capacity. The concert is an all-ages peaceful community event, and will be a tobacco-free, alcohol and drug-free zone. The #SchoolsNotPrisons is funded by The California Endowment and The California Wellness Foundation. The tour stop is presented by Community Initiatives for Visiting Immigrants in Confinement (CIVIC), the Inland Empire-Immigrant Youth Collective, and the Inland Coalition for Immigrant Justice (ICIJ), and produced by Revolve Impact. The tour is in partnership with more than 50 organizations from across California, including: A New Way of Life, ACLU-CA, Advancement Project, American Friends Services Committee, Asian Americans Advancing Justice-Asian Law Caucus (ICE out of CA), Black Alliance for Just Immigration, BLU Educational Foundation, Brave New Films, Centro Del Inmigrante, Children’s Defense Fund-California, Coalition for Humane Immigrant Rights (CHIRLA), Clergy & Laity United for Economic Justice (CLUE), Communities United for Restorative Youth Justice (CURYJ), Congregations Organized for Prophetic Engagement (COPE), CultureStrike, Ella Baker Center for Human Rights, Fathers and Families of San Joaquin Valley, Homie UP, Inland Congregations United for Change, Interfaith Movement for Human Integrity, MILPA, Mobilize the Immigrant Vote, Movement Generation, National Day Laborer Organizing Network (NDLON), Nile Sisters Development Initiative (NSDI), Partnership for the Advancement of New Americans (PANA), PICO CA, Pomona Economic Opportunity Center, Presente.org, Project Kinship, Resilience Orange County, San Diego Immigrant Rights Consortium, Sanctuary Task Force of the Episcopal Diocese of Los Angeles, Sankofa, Self Help Graphics & Art, Sol Collective, The Place4Grace, Training Occupational Development Education Communities (TODEC) Legal Center, Trans Latin@ Coalition, UFCS Local 770, UnidosUS, Warehouse Workers Resource Center (WWRC), Young Women’s Freedom Center, Youth Action Project, Youth Justice Coalition, and Youth Law Center. CIVIC is a national nonprofit devoted to abolishing U.S. immigration prison, while ending the isolation of people currently suffering in this profit-driven system. We visit and monitor 43 facilities and run the largest national hotline for detained immigrants. Through these windows into the system, we gather data and stories to combat injustice at the individual level and push systemic change. CIVIC has been visiting and monitoring the Adelanto Detention Facility since 2012. For more information, visit www.endisolation.org and www.endisolation.org/Adelanto. The California Endowment, a private, statewide health foundation, was established in 1996 to expand access to affordable, quality healthcare for underserved individuals and communities, and to promote fundamental improvements in the health status of all Californians. The Endowment challenges the conventional wisdom that medical settings and individual choices are solely responsible for people’s health. The Endowment believes that health happens in neighborhoods, schools, and with prevention. Headquartered in downtown Los Angeles, The Endowment has regional offices in Sacramento, Oakland, Fresno, and San Diego, with program staff working throughout the state. For more information, visit www.calendow.org. The California Wellness Foundation is celebrating 25 years as a private, independent foundation with a mission to advance wellness for all Californians by making grants for health promotion, wellness education and disease prevention. Since its founding in 1992, Cal Wellness has awarded more than $987 million in charitable contributions, which include matching gifts and 8750 grants. For more information, visit www.calwellness.org. Revolve Impact is an award-winning social action media and creative company that utilizes radical imagination, art and culture to transform global power, politics and people. Founded in 2014, Revolve Impact provides marketing, campaign management, event production, as well as policy advisement and strategic media expertise to a wide range of influential artists, nonprofit and government entities, corporate communities, and philanthropic foundations. For more information, visit www.revolveimpact.com.